Sure, your truck is nice. And it can tow some. But it's not a Ford F-450 Super Duty Limited. It's the most expensive mass-produced pickup ever to drive off an assembly line, according to Ford. It has a special "satin chrome" grill, as well as power running boards that drop down as the door is opened to provide an easy step up into its very high cab. On the inside, the truck has lots of two-tone leather, real wood trim, heated and cooled massaging seats, a premium 10-speaker stereo, and a big panoramic moonroof with retractable shade. The Ford Super Duty F-450 Limited is the most luxurious Super Duty ever offered. 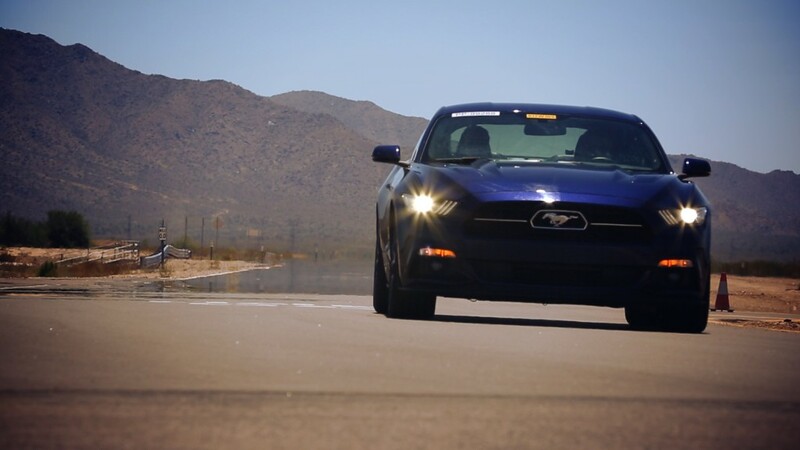 It also has all the technology you'd expect in a luxury car, like active cruise control, which automatically maintains a set distance behind cars ahead, and automatic lane-keeping alerts. "This is like a luxury office on wheels for these customers," Bran Rathsburg, Ford's Super Duty Marketing Manager, told CNNMoney. Ford's Super Duty line of trucks, including the F-250, F-350 and F-450, are big heavy-duty work trucks designed for serious towing and hauling. 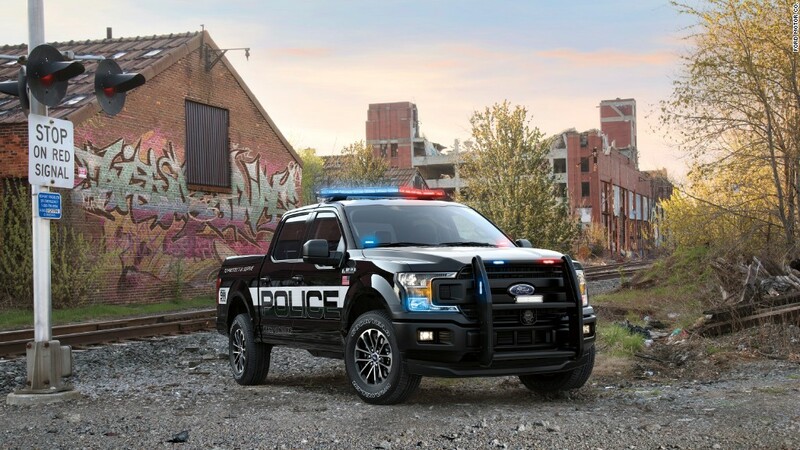 They're considerably larger and more capable than the popular F-150 pickup. They compete against trucks like the Fiat Chrysler's (FCAU) Ram 2500 and 3500 trucks and General Motors' (GM) Chevrolet Silverado HD and GMC Sierra HD trucks. 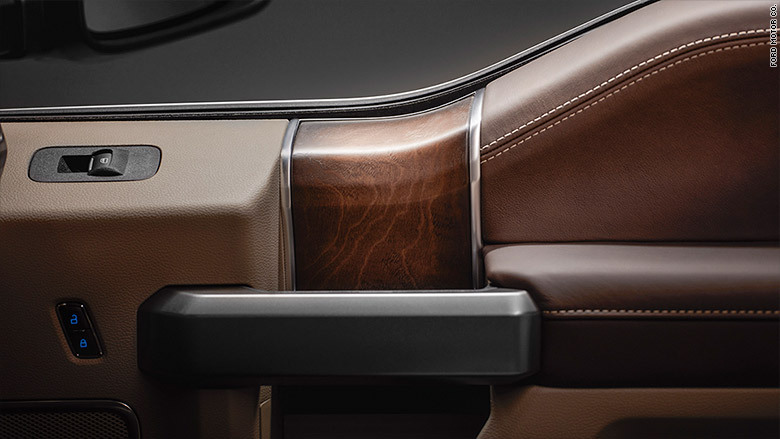 The Ford Super Duty Limited has real wood trim and contrast-stitched leather inside. Ford (F) has offered the luxurious Limited trim on the F-150 for a couple of years now. It's the most expensive trim level on a Ford pickup. Others include the Lariat, King Ranch and Platinum. 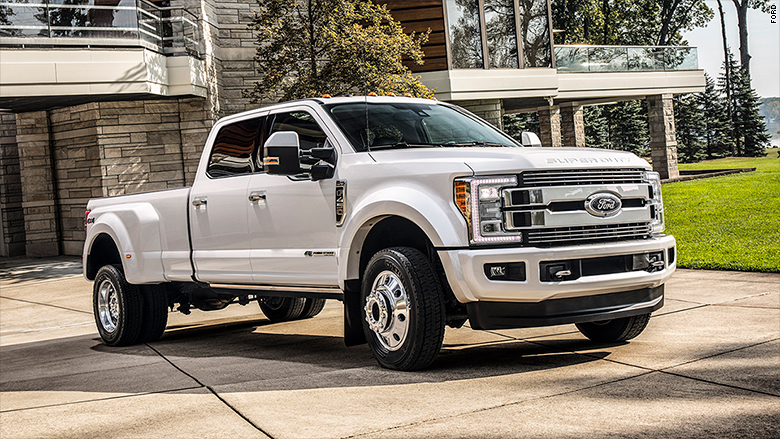 This is the first time the Limited trim has been offered on a bigger Super Duty trucks. The fact that half of all Super Duty trucks are sold to consumers -- as opposed to corporate fleets -- have luxury option packages indicated to Ford that there would be a market for the ultra-luxurious Limited trim in these trucks. The sticker price for an F-450 Super Duty 4x4 is $87,100. Truck buyers who opt for every remaining option -- among those not already included are a truck bed extender and an off-road package -- can end up with a $95,000 truck. After taxes and fees, it'll cost over $100,000. If you're not ready for all that, of course, the cheapest Ford Super Duty truck still starts at just $32,000. Don't expect any massaging seats.